The Ixworth Free School emailed us yesterday asking us to detail some information about their alternative bid to take over Ixworth Middle School under the Government’s Free School initiative. They are competing with the CofE backed by the Thurston Partnership who we detailed information on yesterday. For more information about them please see the Ixworth Free School Website. They have partnered in this bid with the Seckford Foundation, a charity based in Woodbridge who run the Woodbridge Public School. In September this year the foundation opened their first two free schools at Beccles and Saxmundham. Information they wanted to pass on is shown below. ” The Seckford Foundation Free Schools Trust has already opened two successful Free Schools at Saxmundham and Beccles. Both schools held open evenings on 10 October (Saxmundham) and 11 October (Beccles) in which some 580 visitors attended, with many interested in places for their children in 2013 and into 2014 and 2015. You are welcome to drop-in and see our philosophy in action by having a tour of the school. We have traditionally had a long history of school choice after our children leave primary school. In this area, your parents or grandparents may have memories of attending either Beyton or Ixworth Secondary Modern Schools before they were converted to middle schools. The imminent restructure to a two tier system of education in this area will leave our children, for the first time in living memory, with no choice upon leaving primary school. If we all join this campaign and support the proposal, then we can retain that choice which we have all come to value so highly. 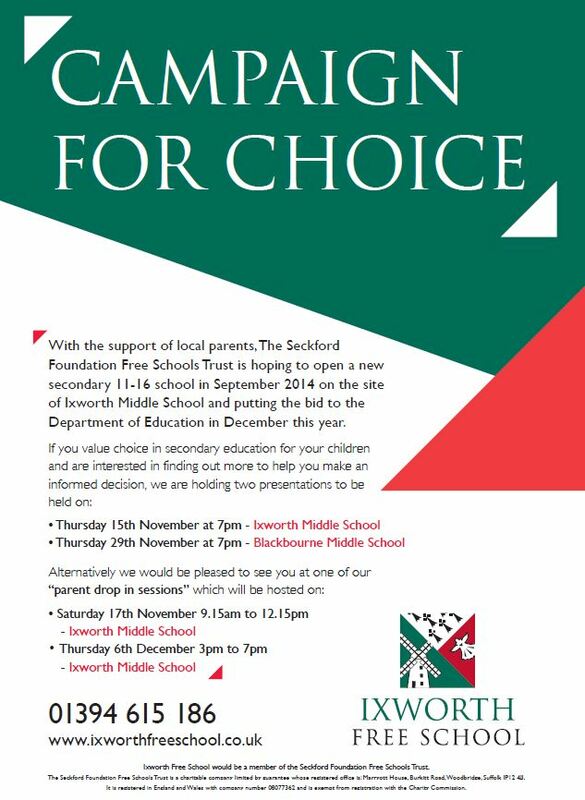 We were passed these details by Stephen Larder – Member of the Ixworth & Stanton Free School Parent Group. The flyer currently being distibuted by the bid is shown below.